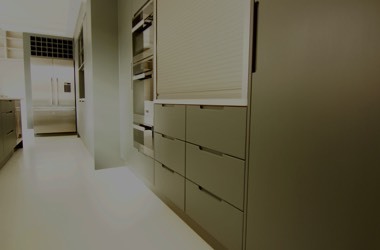 Our bespoke hand painted handleless kitchen are proving very popular as an alternative to the High gloss finish. These kitchens have a contemporary look but also extremely classy with the oak cabinet interiors and solid oak drawer boxes. The routed handle grips can be any width in any position on the doors; they can also right across the whole width. 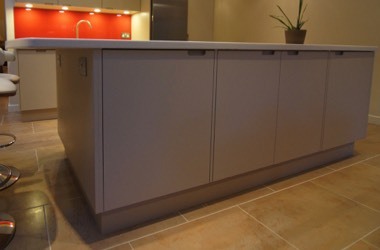 As with all our kitchens, they are made to measure these handleless lay in kitchens are very easy to create a perfect design to fit your space. They are also very competitively priced. 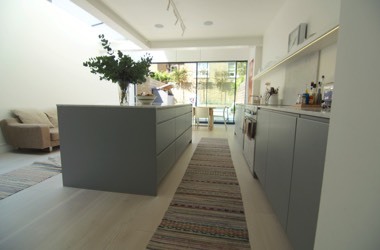 Add some thick open shelving and glass splashbacks and quartz worktops for a fantastic contemporary look.